Faisalabad Cattle Market Management Company Faisalabad Punjab. Faisalabad Cattle Market Management Company invites applications from qualified/suitable candidates for hiring their services/recruitment for the following position on contract basis for a period of one year (liable to extend) with a negotiable salary. b. 5 years' experience in the related field. c. Age Limit 45 Years. d. Pay Package Up to Rs. 100,000/- Per month Competencies & Skills. e. Understanding of the Companies Ordinance to handle corporate affairs. f. Good command on International Standards on Auditing (ISAs) and International Accounting Standards (IASs). Knowledge of Securities and Exchange Commission governing rules and reporting requirements. g. Knowledge of requirements of internal, management and statutory audits. Should have analytical abilities. h. Capable to design and implement internal controls, standard operating procedures, internal audit manual etc. b. 2 Years hands on Experience. c. Age Limit 35 Years. d. Pay Package Up to Rs. 25,000/- Per month. Candidates should submit their applications with detailed CV and attested copies of testimonials with two passport size photographs on the address given below through courier, by hand till November 10, 2018. Applications received after due date or without required documents will be rejected. For further inquiries/TORs of the posts, contact office of the undersigned during office hours. Note: Only shortlisted candidates would be called for an interview. 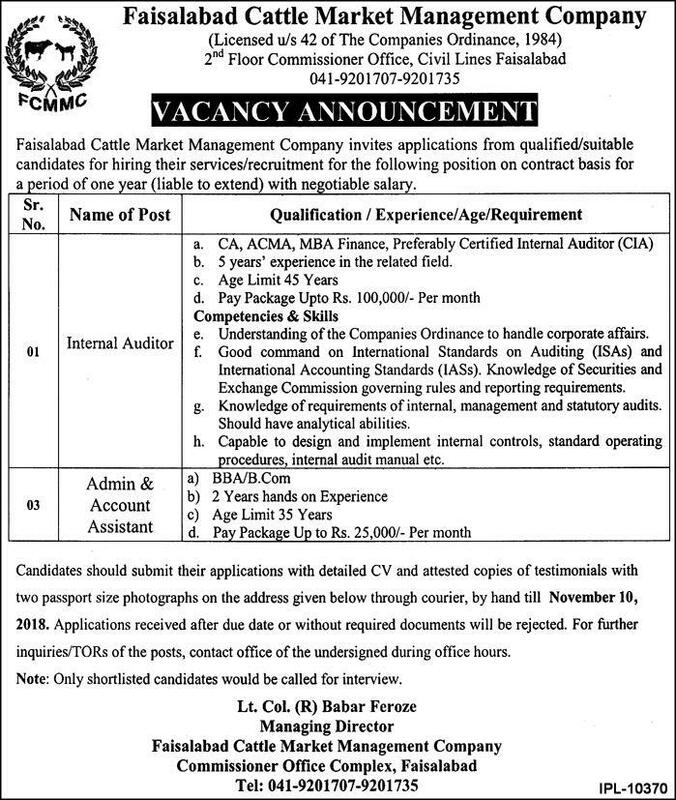 Faisalabad Cattle Market Management Company Commissioner.